The only product proven safe and effective to remove radioactive iodine contamination from your home following RAI treatment. 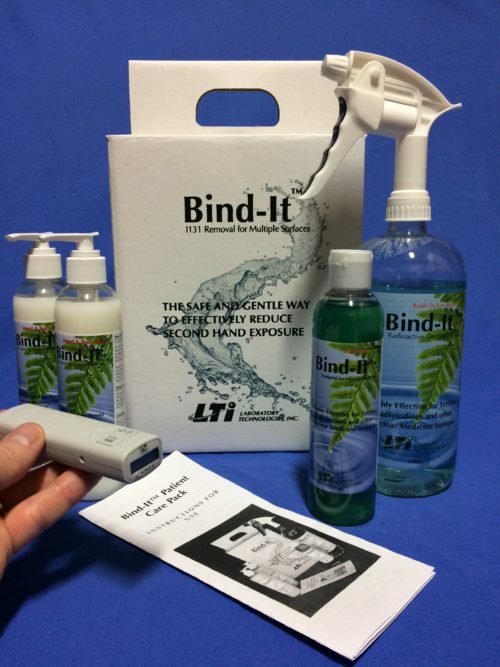 Bind-It™ is used by hundreds of hospitals, for keeping nuclear medicine departments free of radioactive contamination. Bind-It™ is the most effective way to reduce the risk of second hand exposure to family and friends, by removing it at its source before it can spread. Includes a compact, highly sensitive geiger counter, now you can locate, remove and verify decontamination to safe levels . Your order is 100% guaranteed and there are no hidden fees. You can rest assured that your your personal information is always safe and secure. For the most complete protection and peace of mind, we introduce the Deluxe version which includes a compact, highly sensitive geiger counter. Each geiger counter is calibrated in our facility specifically for I131. The geiger counter takes the guesswork out of decontaminating your isolation area. Now you can locate, remove and verify decontamination to safe levels and rest assured your family is truly safe from radioactive iodine in your home. The only product proven safe and effective to remove radioactive iodine contamination from your home following RAI treatment. Used by hundreds of hospitals for keeping nuclear medicine departments free of radioactive contamination. Bind-It™ Hand Soap is used routinely by technicians to ensure they remove all trace amounts of radioactivity from their skin. 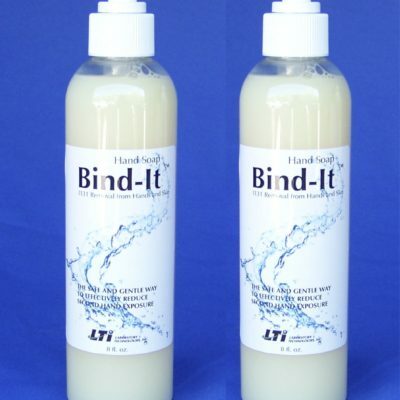 Bind-It Spray is ready to use on your bathroom sink, bathtub/shower and floor. The high power spray head helps to soak the surface with Bind-It allowing it to go to work pulling the radioactive iodine off most surfaces, locking it in solution so it can be safely wiped away. The Concentrate provides flexibility. It is ideal for cleaning the toilet bowl (the largest typical point of contamination), sink, bathtub/shower and for soaking laundry and bed sheets. It can also be used to refill the ready-to-use spray bottle. These items provide the flexibility to clean most surfaces in your home that become contaminated. Detailed instructions for use are included with all orders. The instructions detail what to clean around your home. Iodine is a very reactive element that can end up in some unlikely spots – even attaching to dust particles or becoming airborne. 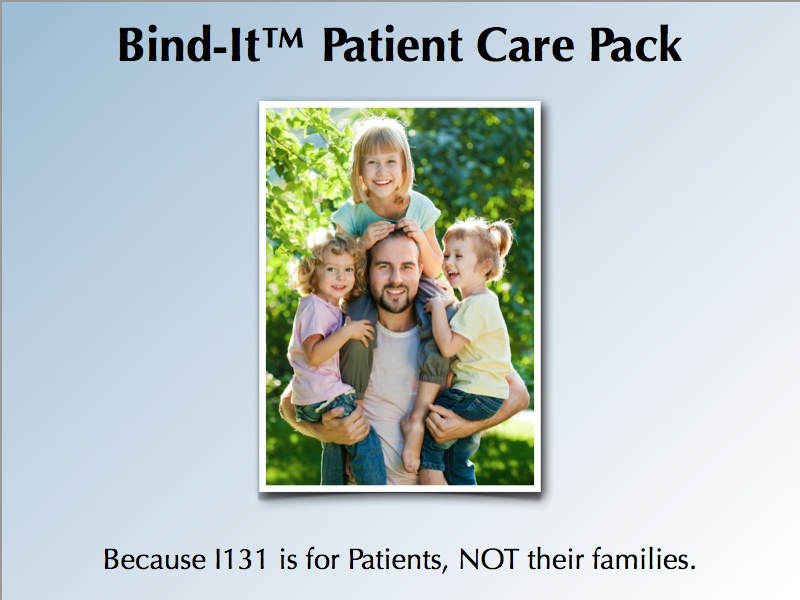 Proper use of Bind-It can minimize second hand exposure to family. If you are not completely satisfied that Bind-It™ products are performing up to the claims we have set forth and successfully removing radioactive iodine contamination, you may return any unused portion for a full refund of your purchase price. Not certain of your treatment date? Prepare ahead; Bind-it can be stored for over 12 months.